The Chinese authorities are actively promoting 'fake medicine' around the world. 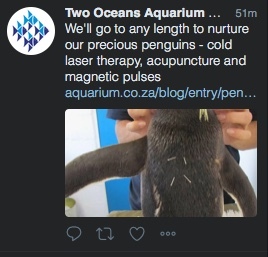 This morning, the Two Oceans Aquarium in Cape Town, tweeted that it was ‘nurturing their precious penguins’ by giving them a range of quack treatments including ‘laser therapy, acupuncture and magnetic pulses’. Teddy [a rescued rock hopper penguin with arthritis] has also undergone an operation on his right foot, had pulse magnetic therapy and receives medical attention on a regular basis. Quite what this ‘medical attention’ consists of though is concerning. The blog post (dated 2013) describes how Teddy is undergoing “an extended series of acupuncture treatments.” Who is giving this treatment is not clear. Nor why it is being given. Acupuncture is a pseudo-scientific form of treatment based on mystical beliefs about how bodies work. The evidence base for the success of acupuncture is woeful with rampant fraud in reporting, selective publication and poor research techniques. There is no good reason to think acupuncture can help with any condition in humans. As you might imagine, the evidence base is even poorer in rock hopper penguins. The elderly penguin is also subjected to other unevidenced, pseudoscientific and superstitious treatments such as ‘cold laser therapy’ and ‘magnetic pulses’. Cold Laser Therapy is an ‘alternative medicine‘ technique often used by chiropractors and acupuncturists. The acupuncturists make a point of using the laser on acupuncture points – the imaginary special places on the body where needles are supposed to be inserted. There is no good evidence that such laser therapy has any therapeutic effects. Magnetic pulse therapy is as equally dubious. The use of magnets to treat ailments has an older heritage than modern acupuncture practices. The magnet was a regular tool of the mountebank and charlatan of the 18th and 19th Century. I commented on the above tweet suggesting that such practices were unethical. The tweet was rapidly deleted without explanation. When a human chooses to use an alternative treatment like acupuncture they do so through their own consent. The treatment can be viewed as ethically given when that consent is fully informed. That is, the person is made fully aware of the risks and is appraised properly of the evidenced benefits. Now, that this properly informed consent is rarely made is not the subject I want to discuss here. What is important, is for an animal like Teddy, the rock hopper penguin, informed consent is of course impossible. The owner, or carer, makes that choice. It is in these circumstances that the utmost care must be taken to ensure that any treatment given to an animal has robust evidence to support it and can be shown to be in the best interests of the animal. For acupuncture, there can be no such demonstration of benefit to the animal, and so such treatments must be considered as highly questionable and unethical. Giving animals superstitious and pseudoscientific treatments can do great harm. It may delay more reliable treatment, if it is available. It may distort compassionate care decisions being made. For very sick animals, it may get in the way of making timely decisions about euthanasia. Animal suffering can be prolonged, stress levels increased and illnesses go untreated. And while the animal suffers, the carer may be the one receiving benefit by believing they are doing some good. Alternative medicine on animals is done for the benefit of humans – psychologically for carers, and financially for practitioners. Animal acupuncture is often described as being thousands of years old and so can be justified as a tried and proven art. This is deeply misleading. The evidence for the ancient origins of acupuncture is not there. Nationalistic distortions are made of ancient texts that are actually describing primitive surgical techniques, such as bloodletting and cutting. Animal acupuncture has even more shaky evidence for ancient origins. A vet, who writes sceptical about such issues, has concluded that animal acupuncture can only really trace its origins to the 1970’s. This corresponds to the massive rise in the popularity of acupuncture across the globe as it was taken on by the New Age movement after incredulous reports starting arriving from Mao’s China of its supposed miraculous effects. Just as back in the 1960’s and 70’s, the Chinese government is still deeply involved in promoting its ‘national medicine’ to the world. It is common to see waves of acupuncture propaganda coming from China promoting ‘Traditional Chinese Medicine’. Just last month, most newspapers in the UK, including the Guardian, the Telegraph and the Daily Mail carried the same story and accompanying pictures from a Reuters feed about how the ‘craze’ for pet acupuncture was sweeping China. The article describes how a clinic in Shanghai is using techniques ‘thousands of years old’ to treat paralyzed pets as an alternative to having them put down. The article were completely uncritical and carried the stories as if acupuncture was a meaningful alternative to ‘Western’ medicine. ONCE eyed with suspicion for not being scientific enough, traditional Chinese medicine might just be about to take over the world.” So opined China’s state-run news agency, Xinhua, in an article last year. It was, of course, indulging in playful hyperbole—even the Chinese Communist Party has no plans to supplant modern medical science with ancient and unproven forms of treatment. But the party is serious in its efforts to promote the use of such remedies (commonly known as TCM) globally, and to reinforce China’s own extensive network of TCM hospitals and clinics. China is subsidising the education of acupuncturists and herbalists in western countries and see its export as a ‘new source of growth’ for the Chinese economy. Standards in exports of herbal products is appalling. And many vets in the UK lap this up as source of revenue for themselves. There is even an Association of British Veterinary Acupuncturists that claim to uphold ethics and standards among practitioners. The regulator of vets, the Royal College of Veterinary Surgeons, tolerate this money making from their members, just as they tolerate the inclusion of veterinary homeopaths in their fold. Animal welfare is obviously secondary to the ability of their members to make money from worthless and unethical treatments. It always amazes me how we casually and blithely accept acupuncture despite the fact that is founded on obvious mumbo-jumbo and has an evidence base that is composed mostly of studies from China that are little more than simple promotional propaganda. Our animals deserve better. If your vet offers acupuncture, find another vet. If your aquarium or zoo is giving acupuncture to its animals, choose another day out. Kind of surprising that the penguin is alive after 4 years. By your standards itself, this is perfect cure. Hmmm. As a scientist I agree with your skepticism, and there certainly has been a good deal of fraud in the acupuncture area – almost as much as we have seen coming to light in pharmaceutical research, where the financial motivation for fraud is so much greater. And yet, and yet … Even when the ground is shaky – and perhaps especially when the ground is shaky – we should not be afraid to look at case histories, where so much of medicine still originates and must, eventually, return to. My wife has a pair of French bulldogs, which I disapprove of as they are entirely man-made and prone to all kinds of genetically linked problems. One of them developed, as so many do, hind limb paralysis due to X-ray diagnosed spinal misalignment and intra-vertebral disc damage, with associated muscle spasm. He was in considerable pain, unable to eat, raise his head, walk etc. This is a condition which does not spontaneously remit. The local vets offered two options; surgery at $8000 a pop and with a less than 40% favourable prognosis, and acupuncture at $150 and no prognosis at all. The dog is old and probably would not have survived surgery. I argued for a mercy killing, but my wife opted for acupuncture. After a course of treatment the dog was returned, and is now, at a behavioural level, back to normal. He no longer displays any signs of pain, and is fully mobile. I do not believe that his structural issues have been altered in any way, and fully expect the problem to return at some stage; but the alleviation of the muscle spasms, which can easily be felt around the spine, has given this over-priced mutt an extension on life. Placebo effect, self-deluding woo? Maybe. However, the acupuncture was 14 months ago, is still ‘working’, and seems to have been highly cost-effective. In this case. Thank you for your anecdote. Can you think of competing explanations to the dog’s recovery other than magic pins worked? iVDD, the condition that the dog undoubtedly still has, does not heal itself. If left untreated, the affected animal has to be put down. What has changed is the muscle spasm, a supposedly protective response that usually makes matters worse. This has gone, it disappeared after the acupuncture and has not returned. One could put this down to coincidence, the easiest explanation for skeptical souls. This is what I told my wife,. She then found seven more dog owners at the same practice, with near-identical stories. One coincidence is a coincidence, seven is the kind of smoke that suggests – to the inquiring mind – that there may be a fire somewhere. If I knew i had a degenerative disease that would lead my owners / employers to euthanize me, I would try to bluff it out. Perhaps the dog is bluffing. What would your explanation be? I am of the opinion that if you turn this QUACKOMETER blog into writing about failures of the “scientific medicine” you will get a lot more traffic from patients hurt by so called medicine to agree to your views. It will also be possible to retrieve reams of data that will prove each of your point easily. Also the number of issues would be so large, that you can employ few persons for writing blogs in your name. PaulC, I have very active dogs that have been in a lot of pain with muscle spasms across their backs. Running my fingers down either side of the spine has provided them with relief very quickly, and sometimes relief has occurred simply by petting them, the muscles have twitched, and the dogs have regained more comfortable movement almost immediately. So I doubt your acupuncture achieved something special. For all we know, it could have been achieved simply by touching the dog. I have a friend who is a canine massage therapist, who treats a lot of injured or post-surgery dogs. She sees the same on a regular basis. Yes, this is a possibility. But as I said, the therapeutic effects have lasted well over a year now and given the underlying and substantial pathology, it is not a likely possibility. I have painfull back spasm due do overexertion. Acupuncture has definately worked for this. It is time that the medical science and so called alternative medicine start combining forces. That way the alternative medicine can also be regulated and you can seperate the true professionals from the scammers. I work for a veterinary practice and has seen firts hand how effective this treatment is in especially dogs. If pain can be aleviated and quality of life restored and life prolonged in humans, why not in animals too. We should not take anonymous posters seriously. How do we know they are not frauds, in the pay of the needle manufacturers, in need of medical help? This post demonstrates not only bad spelling (or no attention to a spell checker), but ignorance as to how ‘science’ works. Medical science has grown away from ‘alternative medicine’ precisely because the ‘alternatives’ did not withstand the scrutiny of scientific inquiry. ‘Science’ should not be dragged backwards – that is not in the nature of science. Regulation is not fool-proof. Some ‘professionals’ are also scammers. They are outed when possible – and there is no point in regulating pseudoscience. Treatments which have been shown to work in humans do indeed (with some exceptions) work in other animals – particularly, mammals. But acupuncture has not been shown to work any better than a placebo. That’s the point. Actually Richard, I think anonymous and Iqbal make some valid comments. “It is time that the medical science and so called alternative medicine start combining forces.” I’ve tried to do this having trained as a medical herbalist as well as being a senior lecturer in clinical pharmacy. Hundreds and thousands of people are seriously being harmed by the conventional medicines people are taking. I’ve audited loads of practices and 25% of the people with dementia I deal with are taking antimuscarinics which reduce cognitive function and antagonise the action of their dementia drugs. I think this puts Andy’s precious penguins into perspective. And who funds the “science”? So many studies are biased and all research needs money. The people making the most money are big pharmaceutical companies who don’t really want to research ways to cure people that don’t involve people taking the pills they sell. The best approach to anything is multi-faceted, in medicine this means treating anything holistically and that entails being open to alternatives. What is the fact that many pharmaceuticals and conventional medicines (sometimes) harm people got to do with the issue in hand – the integration of alternative pseudo-scientific therapies and (specifically, on this tpost), with acupuncture for non-human animals? Oh dear Richard. If your looking at pseudo-science look at the evidence base for type 2 diabetes (a slightly significant problem) drugs. You’ll find that only one has any real primary endpoint data (metformin form a plant). I personally couldn’t give a flying whether a pengiun gets acupuncture when millions of people are facing significant harm from inappropriate conventional therapies. It’s time to review all conventional medicines and ban all those without robust primary endpoint data. Don’t you agree, Richard. ‘Conventional medicines’ are being reviewed all the time..
Dr Lewis has raised the issue of acupuncture in non-human animals. Please keep to the point, start your own blog (and use a spell checker), and refrain from dragging red herrings into the debate. Thank you. I must write my own book on the dangers and inappropriate use of many conventional medicines. I might get more than one 2 star review on Amazon. 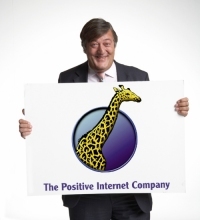 I think there is a message for you, Andy, David, Simon, Ben et al. People are developing new medical condition called cynic fatigue. The fact that you dismiss the fact that ten of thousands of dementia patients are being harmed by their medication and wish to focus on a penguin speaks volumes for your agenda. I shall put you in my “Do not write about this, write about that.” category of critic. I’m hoping you can elaborate on how it should be in the same category as animal cruelty/torture. That involves either actual malice or gross negligence. Getting acupuncture may be misinformed, but it seems to me to be a stretch to classify it as “cruelty,” to say the least. I have made it quite clear in the article. I presume you have read it. Anyone who gives acupuncture to an animal is incompetent and negligent. There is no good evidence it can help with any condition. Treating with acupuncture may prolong suffering and delay effective treatment. Animals cannot make informed choices about treatment. This makes it critical for decision makers to ensure evidence is guiding treatments and not personal beliefs. I did. There may not be evidence it helps, but does it inherently prolong suffering in every instance without exception? “Do not write about this, write about that” category. Also known as ‘tu quoque’ combined with red herring and a small dose of straw man. All of which are logical fallacies. I do wish Robin was able to debate the issue in hand, and not some other from his own agenda. I await details of his own blog site where he expounds further. Happy to debate the issue in hand. I haven’t been able to sleep properly since I read that Teddy was getting acupuncture. Syria, North Korea, US opioid crisis, UK fentanyl/pregabalin crisis and the fact that a large slice of the BNF has no evidence base slipped from the back of my mind when I read about poor Teddy’s torture. Just glad you guys are around. Should cooking books be forbidden then? Writing about how to make tasty meals surely is not as important as Syria, North Korea, and the dangers of medicine? Also in the news. Police are stopping all investigations into physical assault as murder is worse. I am terribly sorry to hear that you do not think I should be discussing animal welfare issues on this blog. Perhaps you could supply me with a list of issues that you feel worthy of discussing and the priority order in which we should tackle them. No problem. Inappropriate polypharmacy. Just setting my masters students off to do audits for their dissertations in practices looking at how dementia, heart failure and Parkinson’s can be aggravated by medications they are taking for other chronic long term conditions. As discussed, a quarter of patients I see with dementia are taking drugs which reduce cognitive function significantly. Use of non evidence based conventional medicines in conditions such as type 2 diabetes, COPD etc. which can cause significant harm.The point I’m making is that I wished the critics of alternative medicine would see the bigger picture. Should the NHS provide homeopathy and acupuncture? I would say no but this is small potatoes considering the much bigger issues with conventional medicines. Surely, if we are to sensible about science then the playing field should be level for both forms of medicine. The situation here in the US is even worse, with 70% of Americans now on one prescription drug and 20% on 5 or more (Mayo Clinic ’16), including over 8 million kids taking one or more psychiatric drugs (VONA and TPT ’13). All this at a time when, as per the latest Global Burden of Disease report, poor diet is contributing to 1 in 5 deaths world-wide (and therefore to an equally large amount of disease, which is likely to include mental illness). It is blindingly obvious that the post-hoc and fundamentally Pasteurian model of healthcare is failing, that the regulatory agencies have become grotesquely dysfunctional (former FDA commissioner Margaret Hamburg is facing charges of fraud, conspiracy and racketering), and that the Pharma industry, operating within a corporatocracy, has become malignant. These issues are indeed important; but that is not Andy’s schtick. Do charges equal guilt? The US is a capitalistic country, it’s what defines us, corporations are a big part of that and they do what all corporations do, sell their product to make money, is that unusual? I don’t see how you go from people are receiving treatment to blaming that which treats them as the cause, or from this is what’s happening in the US to global poor diet. When you compare the harm caused by magicopathy to the harm caused by evidence based medicine the magic wins, now, lets look at the profit made by magicopathy, how is that different from the “Pharma” industry? I’m wondering, all those cases “proofs”, how did you handle and count the cases where the animal DID NOT RESPOND, you ignored them or didn’t even look for them I’m sure. But evidence for the benefit of ‘alternatives’ is awaited.